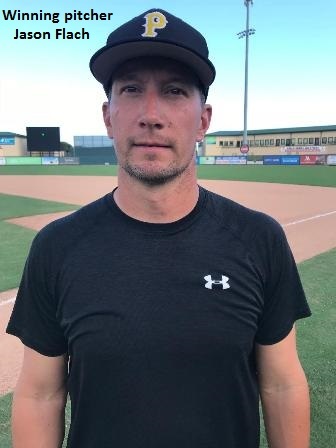 November 10, 2018, Jupiter, FL – Trailing 3-0 early and with an Atlanta Braves lineup that’s all-too familiar with his pitching style, Jason Flach had to change tactics in a hurry. Thanks to a defense as tight as the one behind him, it was a no-brainer. Flach tossed his second complete game and earned his third victory of the tournament, while defensive stalwarts Pat Moretti (SS) and Luke Roberts (2B) shared MVP honors, as the Carolina Pirates captured a second consecutive 45+ American Fall Classic championship over the Atlanta Braves, 6-3. Still, having played Atlanta multiple times during the past 12 months, the task was once again not easy for Flach and the Pirates. 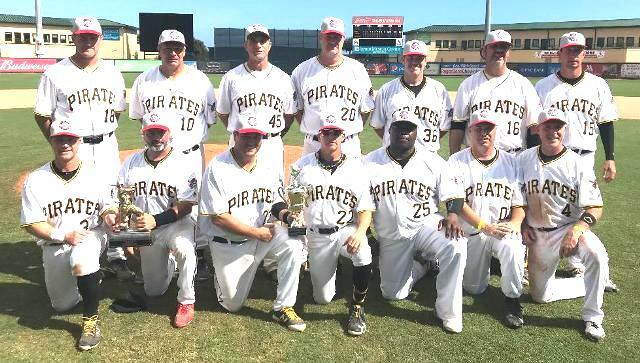 Carolina topped Atlanta 3-1 in the 2017 Fall Classic championship game in Clearwater, FL, before losing the 2018 Memorial Day Tournament title game 6-5 to this same Braves team. Trailing 3-0 in the fourth, Carolina, which finished round robin play 4-1 thanks to a pair of walk-off victories, needed one more come-from-behind win to capture the championship. The Pirates combined an infield single, error and walk to load the bases with two outs. Chris Wilder’s single to left drove in a pair of runs, before John Kelly tied the game with a single to center. An inning later, Carolina provided Flach a lead he wasn’t about to relinquish. 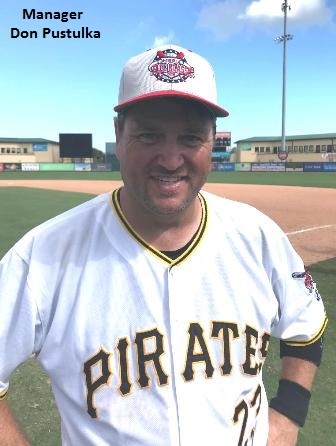 Todd Warren opened the inning with a single to center, and when he beat Atlanta starter Chris Evers’ throw to second following Kirt Bennett’s sacrifice bunt, the Pirates had two on and none out. That’s when one of the game’s most pivotal plays occurred. The Braves committed four errors on the day. Carolina, which entered having committed only four errors for the tournament, did commit two in the championship game. Still, it was timely defense and key pitches that first kept Atlanta from adding to its early lead, then prevented it from making a comeback. Leading 3-0 in the fourth and with the lefty Evers facing the minimum to that point, the Braves threatened to blow the game open. 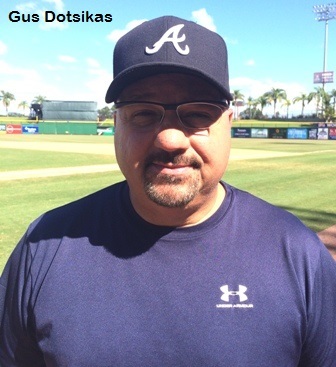 A pair of one-out singles placed Atlanta runners on first and second, but, as he would again twice more, Flach made key pitches to emerge unscathed. Getting a pair of ground outs, the righty kept the deficit at three and set the stage for the Pirates’ six-run outburst over the next three innings. Atlanta put a pair of runners aboard with none out in the sixth and two outs in the eighth, but both times failed to score. In the sixth, the righty stranded Nohstadt and John DeMarco on base by getting a pair of strikeouts and pop-out to end the inning. In the eighth, a ground out to second kept an infield error and walk from causing damage. Atlanta, which finished round-robin play 3-2 and reached the title game by defeating the Criollos de Venezuela (4-0) and New York Astros (6-1) in the playoffs, grabbed a 3-0 third-inning lead thanks to an uncharacteristic error to lead off the game and a trio of timely hits. The early lead was an achievement in itself considering Carolina had allowed only 13 total runs in its first five games. Roman Marcano’s grounder was misplayed for only the fifth Carolina error of the tournament and, after being sacrificed to second, sped all the way home on a wild pitch. Two innings later, Marcano laced a two-out double down the third base line and scored on Jeff Burns’ single up the middle. When Jack Myers’ bloop to left fell in, Burns pushed the lead to 3-0. WP: Flach (2-0). LP: Evers. 2B: Marcano (A). Munn (C). Pitching: Evers and Caldwell (A). Flach and Robinson (C).